This article is 3055 days old. Departing greatly from their last show, sell-out hit Reefer Madness, Korda Artistic Productions is getting ready to make Windsorites of all ages laugh and cheer with King Midas and the Golden Arches. Korda continues to do what they do best, performing fantastic musical theatre at the unique KordaZone Theatre on Seminole Street. 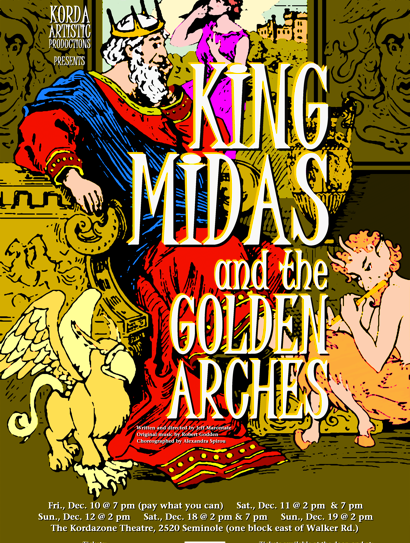 King Midas and The Golden Arches is an original “panto” written by Jeff Marontate, adapted from the ancient Greek myth. For those of you who don’t know, a “panto” is defined as “traditional British Christmas entertainment for children, usually based on nursery tales and featuring stock characters in costume who sing, dance, and perform skits.” And for those of you who forget, King Midas was known best for his ability to turn anything he touched into gold. Local stars singing in the leading roles include Matthew Froese in the role of King Midas, Jeff Marontate playing Queen Midol his wife, Carla Gyemi playing Princess Marigold, their daughter, and Jonathon Tessier as Popsicles, Marigold’s beau. Kids are sure to enjoy the original music, which is arranged by Robert Godden, while the adults in the audience will appreciate the innuendos shining through the story. Dan MacDonald plays the part of King Testicles (Popsicles’ father), and Christopher-Lawrence Menard takes on the role of Queen Amnesia (Popsicles’ mother). Rounding out the cast is Michelle Grenier as Shmedusa The Demi-Gorgon, Tracy Atin as Sid The Satyr, Allen Lavack as Dionysus The God of Wine, and Liz Xu, Ameila Daigle and Paul Sanford making up the Ensemble. Just the cast of characters makes me want to find out what hilariousness the Korda folks are getting up to for this year’s panto. King Midas is actually the fourth original panto Korda has staged. In previous holiday seasons, the crew has performed productions of Cinderella: The Unauthorized Panto, Robin Hood, and Hansel and Gretel: Behind the Gingerbread. Each has featured characters in “bad drag, and inventive animal costuming”, spinning classic tales into modern and vibrant stage shows. King Midas and The Golden Arches opens this Friday, December 10th, with a “pay what you can” (minimum $5) preview taking place at 7pm. The production’s run continues throughout the following two weekends, with shows on Saturday the 11th at 2pm and 7pm, Sunday the 12th at 2pm, Saturday the 18th at 2pm and 8pm and finishing up on Sunday the 19th at 2pm. Tickets are $15 for adults, and $8 for students. You can save a few bucks by paying $20 for a Family Pass (good for one adult and one student), or $40 for a bigger Family Pass (good for two adults and two students). Tickets are available at Motions 1 (3898 Walker Road), Nancy Johns Gallery and Framing (4755 Wyandotte St. E.), or at the door on the night of the performance. The Korda Theatre is located at 2520 Seminole Street (one block east of Walker Road).